The Global Mental Health Program at Columbia University is reducing stigma, increasing understanding, and building capacity for mental health around the world through education & training, research, and advocacy & the arts. Our Innovation in the Arts Award recognizes the arts as a means to engage populations across communities and cultures around the concept of mental health, and to convey messages that can counter misunderstanding, fear, and prejudice. We present the award each year to an extraordinary artist breaking down barriers in the global conversation about mental health. Sarah Jones is a one-woman global village, and she received the 2017 Global Mental Health Award for Innovation in the Arts in honor of her unabashed exploration of people’s struggles, and her crusade to preserve the full humanity of voices seldom heard in the theater. 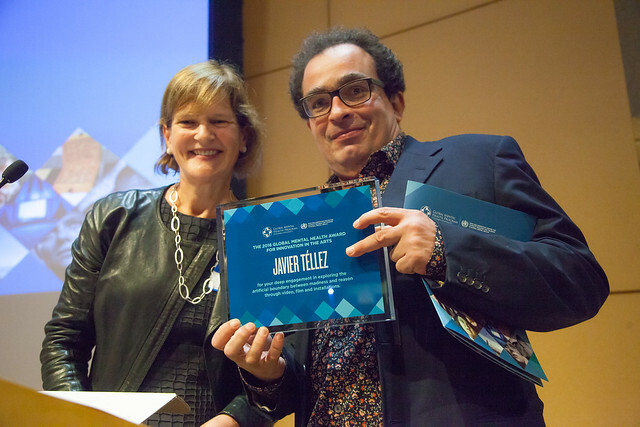 On November 9th, the Global Mental Health Program presented Javier Téllez, acclaimed Venezuelan artist and filmmaker, with the 2nd Global Mental Health Award for Innovation in the Arts. Son of two psychiatrists, Tellez’s award-winning films and installations question definitions of normality and pathology, diminishing stereotypes associated with mental illness. Our program will include film clips, lecture, and discussion with this extraordinary artist. The event was moderated by John Hanhardt, Consulting Senior Curator, Smithsonian American Art Museum. Using film, video, and installation, Javier Téllez (b. 1969, Valencia, Venezuela) questions definitions of normality and pathology. Tellez’s 2005 video One Flew over the Void (Bala perdida) documents a parade organized by the artist in Las Playas, a town on the border of Tijuana and San Diego, which featured ordinary citizens and patients from a local psychiatric hospital (the last disguised behind animal masks and wielding signs protesting various injustices). The action ends with a human cannonball being shot over the border into the United States, underscoring the hardships faced by the millions of Mexican and Central American workers who cross the border illegally every year in search of a better life. Read more about Mr. Téllez here. Pete Docter and Ronnie Del Carmen of Pixar Animation Studios have revolutionized the conversation around mental health through their portrayal of emotions in the animated film Inside Out, earning them the inaugural Global Mental Health Award for Innovation in the Arts. After treating the audience to a stunning inside look at the five-year creative process that went into making of the film, Mr. del Carmen accepted the award on Pixar’s behalf and thanked the University for recognizing their groundbreaking efforts to bring heightened emotional intelligence into family conversation around the world. Janet Montag, Chair of the International Advisory Board of the Global Mental Health Program presents the Global Mental Health Award for Innovation in the Arts to Ronnie del Carmen, Pixar Animated Studios Co-Director.